This time, I made a concerted effort to find someplace good for breakfast that was off the beaten track. A quick web search lead me to Belmont Hall, at the corner of Grove and Belmont SE of the Verizon Arena. This is definitely a place for locals, being well off the normal throughways through town. The restaurant itself is half function hall, and half dining room, tucked away in a little residential area. I obviously had stumbled across a local treasure, however, since the place was thoroughly packed on the Saturday morning I was there. And it was obvious from the plates of waffles, pancakes, and hash coming from the kitchen that the food was good. After looking at the menu, I ended up settling on the pulled pork hash, a dish which I haven’t seen before, but seemed like a good idea. Carol ended up getting the pancake special, which looked good as well. I’ll have to say, the hash was very pleasurable: the pulled pork was good, added a nice sweetness to the dish, and the potatoes were nicely crisped and not greasy. 1. Hash browns. Most places in New England don’t have shredded hashbrowns. Belmont Hall does. Cons: None. I had a thoroughly enjoyable breakfast. 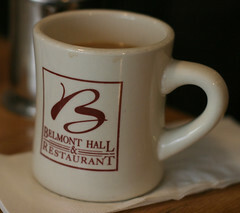 I’ll definitely add Belmont Hall to my list of places to grab breakfast when I’m in Manchester. And I look forward to trying lunch there at some point as well. One of the simpler foods that I really enjoy is a good ramen noodle shop (indeed, I’ve reviewed rather a lot of them). It’s been one of the upcoming trendy foods, with ramen shops opening up all over the place, some more Japanese-inspired, some more Korean-inspired. But they are almost always tasty. But it’s also one of those trends that hasn’t really made inroads into New Hampshire yet. But it’s almost here, indeed, a recent trip to Portsmouth had us crossing over to Kittery in search of dinner, and we ended up finding Anju Noodle Bar just over the river from Portsmouth, in scenic downtown Kittery (right across from one of the entrances to the shipyard).